Hi! 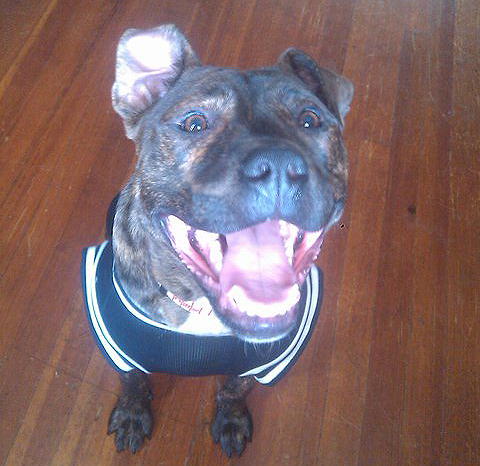 I’m a brindle and white Staffy mix! I am 1 and a half years old. I’m currently in foster care. I will tell you my story as I recall it. I was roaming the street with my brother and an officer saw us. The officer brought us to the ACCT powered by the PSPCA. Here they made sure we were healthy and we were set for adoption. 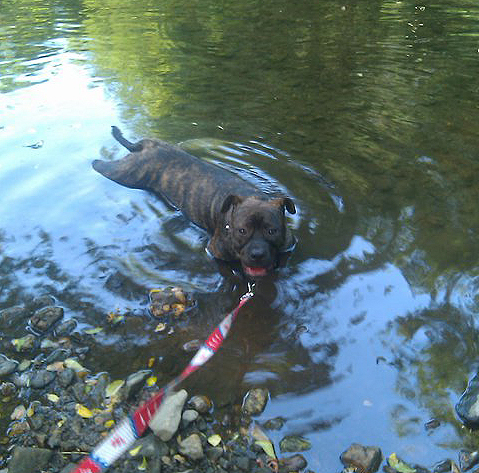 A few weeks later I got very sick with a common kennel cough, very similar to a human flu. A nice vet nurse from this place saw me and decided to take me home with her to take care of me until I got better and set me for adoption, my foster mom! 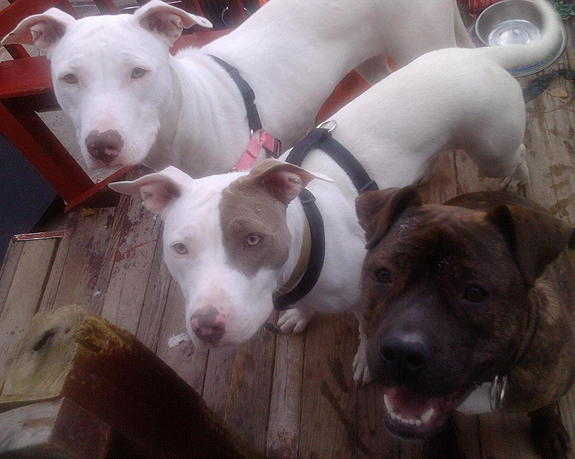 First I meet a white annoying pittie, it was like a play date with her. Vet nurse saw we played very gentle with each other and we were compatible with each other. That same night the nurse took me out of the cage and told me “Come on! We are going home!” It was cold outside and we went into the car with the white little pittie. Later we arrived at a house that smelled very interesting. The white, little pittie brought toys to play with. We ran playing! 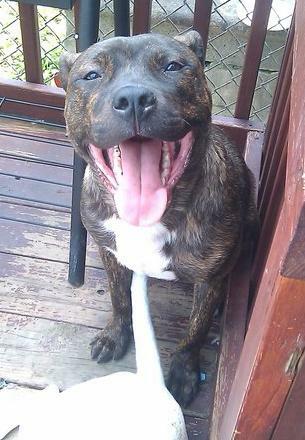 Then when my foster family went up the stairs I panic, I could not go up stair, I was too afraid of stairs! I started to hide. I did not tell my foster family I did not have a good puppyhood, and something happened when I was a puppy. I was afraid of many things that would make me be submissive and scared. This night my foster dad had to carry me up stairs. A few weeks later my brother got adopted from the shelter by a great family! My foster family thought me to be a very confident pup and a sweet guy. I was adopted a few months later, but my adoptive family did not have time for me since my human sister was always sick and I was returned three months later to my foster mom. My foster mom and dad are taking care of me and teaching me to be a nice guy. Between us, she says I act like a big pup, but in reality is that I AM a big pup! 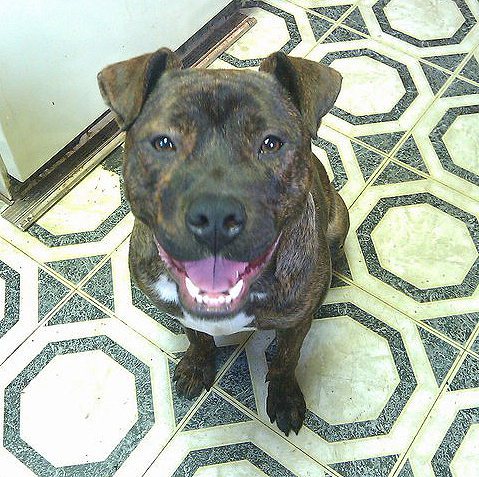 My name is Joker Boy, since you can see I am always smiling!!! I already know my command ‘sit’ very well and ‘down’, ‘stay’ is still very hard for me, when served food I know ‘wait’ and ‘ok!’ My family also taught me ‘paw’ & ‘hi five’ but for this last one I like to do a ‘hi 10!’ I cannot stay still, I’m very wiggly! I am also crate trained! Between us, why a crate?! That ruins all the fun, but if you toss in a Kong stuffed with peanut butter I will fly inside of the crate! My foster mom has been teaching me some manners with my two sisters,but I find playing more interesting! I love cats and I live with three. I have to say that I love them too much, so if I go to a home with cats, supervise me. I love other dogs, I live with two girls. Kids, I like them, but I prefer a house without them. I believe I am not that heavy! But in reality I weight 69.2lbs! I would looove for a family to call my own that could take me for long walks and exercise. I have to say I have a lot of energy- my foster mom says I have energizers in me!!! I loooove to play for hours, but I will cuddle at the end of the day-I promise! I love to lie on human sofas and beds with my family and Iove toys. I also love to swim and pools! I reeeeaaallyyy want a family to call my own, especially during this time of year, would that be you? 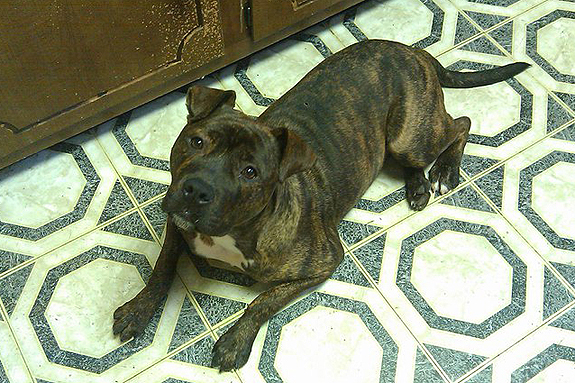 For more information about me, to meet me or to adopt me, contact my foster mom Kiara Colon at [email protected]. 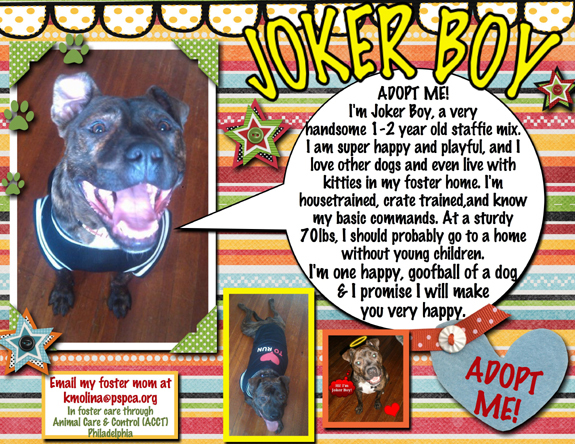 Joker Boy is located in Philadelphia, PA. He is with the Animal Care and Control Team of Philadelphia , ACCT powered PSPCA. For more information, you can check them out on the web. 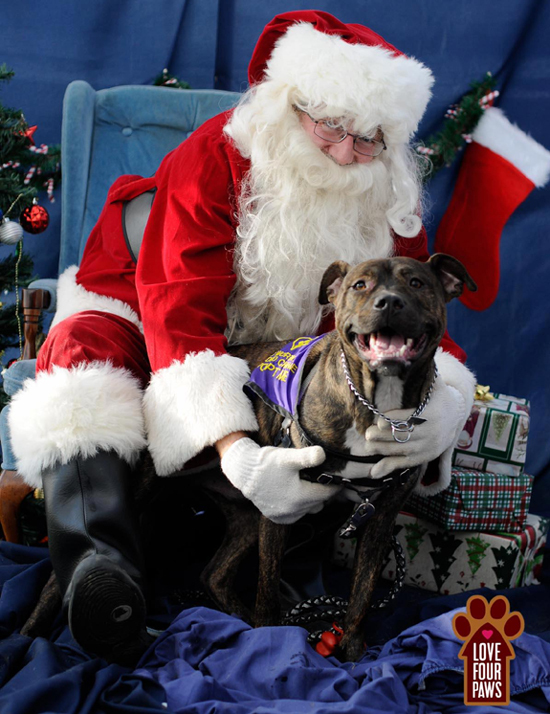 Or visit the PSPCA here or on Facebook.